Sounds cool, doesn’t it? Yet a bit academic – I agree. So why this title? It is as precise as it gets. And it’s less 140 chars, so I can even tweet it. Yet no worries, I’ll enjoy dissecting the headline for. There are a number of important messages. To make it more readable I will split it into three parts. So let’s get to the topic right away (which by the way is precompilation). To prove it makes a real difference, I will show in part II how you can measure the effect of precompilation since quite often people fail to do so. Later in the cool part, part III, we look at some exciting bells and whistles for web applications (Twitter Bootstrap framework). Why would you precompile your application? Precompilation isn’t really necessary to make an application work correctly. 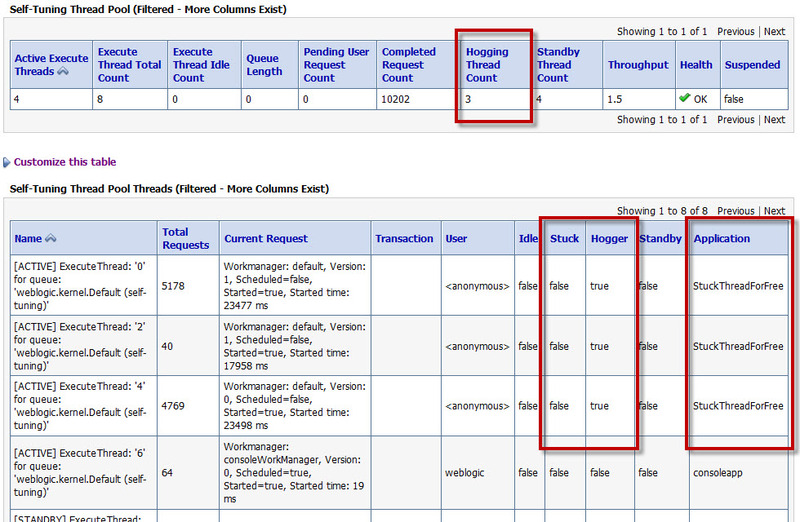 WebLogic will compile necessary artifacts when they are needed. For example a JSP page which is not precompiled will be compiled at the time it is accessed. Deploying an application without precompilation forces you to use lame excuses such as “It’s a bit slow right now, because it is running for the first time after deployment“. I am sure you don’t want to be remembered for lame comments. Running your applications without precompilation costs you time. And time is expensive. What is the difference between precompilation and compilation? Well, every Java class has to be compiled before it is executed by the JVM. 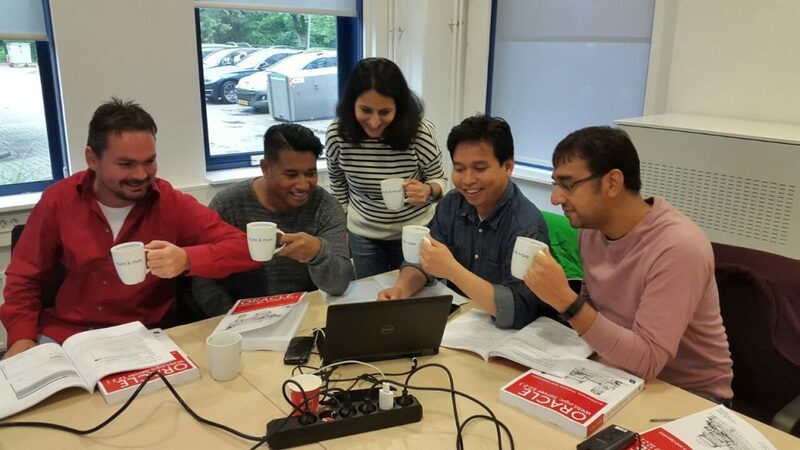 The .java file is converted into a .class file. Other stuff, such as a JSP page could be deployed as is. It will then be compiled by WebLogic. The JSP is converted into a servlet Java file which in turn is compiled into a .class file. 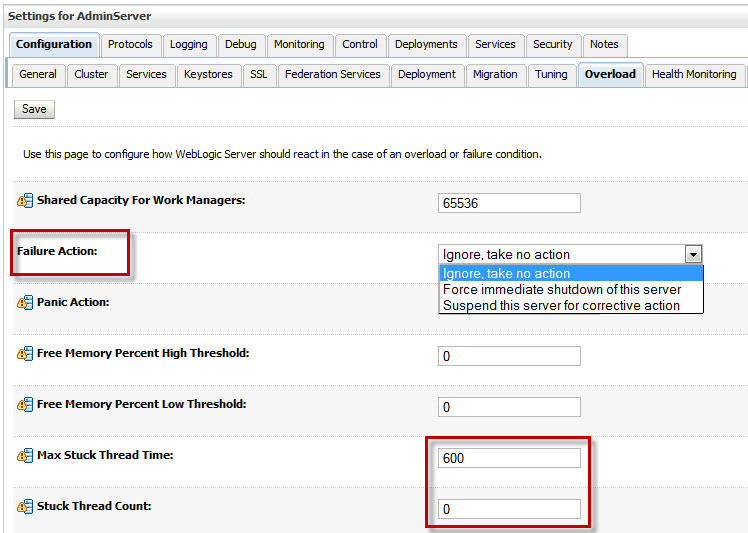 You can request WebLogic to precompile your application right after deployment. To do so set the XML element <precompile>true</precompile> in the weblogic.xml deployment descriptor. Many projects seem to use this solution, but it is certainly not the best idea. There are at least two reasons why I am not a big fan of this solution. 1.) Using the setting mentioned above precompilation happens right after deployment. This is the time when you want to show off your application. However, the application is not precompiled yet. 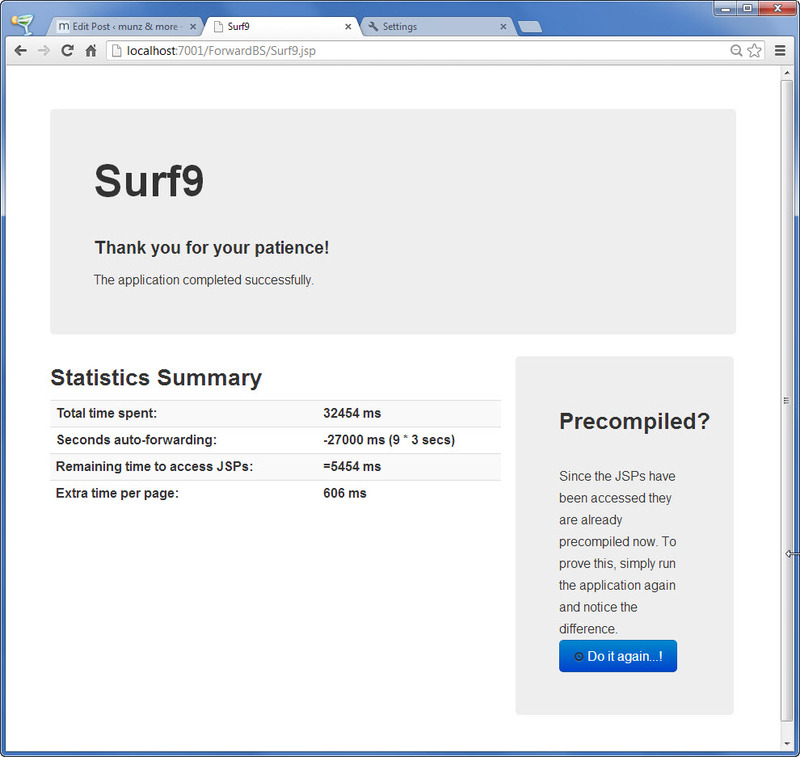 Even worse, during precompilation system resources are used and the application is slowed down. 2.) When setting the <precompile> element, the application is precompiled after redeployment and after server restart. Do you really want your application to be precompiled after every server start? I recommend to precompile before you deploy. If building your application takes a long time, precompiling will make the process even longer. Then consider to have two different build targets: One for quickly testing your application without precompile, another one with precompile for load testing and deploying your application in an production environment. Note, that the former JSP precompiler weblogic.jspc is deprecated. Sometimes JSP fragments are included within a JSP yet these JSP fragments are not syntactically correct JSPs. Now if the fragments have a .jsp extension the precompiler will try to compile them and fail, therefore you should set the tag <precompile-continue>. Then precompilation will continue on errors. Also there are faster compilers than javac. You can specify a different compiler with the switch -compiler. If you use Maven to manage yours builds, Maven can call the application compiler appc for you when building you application. So everything in the paragraph above applies to building your application with Maven as well. If you precompile the deployment module before deploying, the classes will be added to the module and you should never see WebLogic compiling them again. 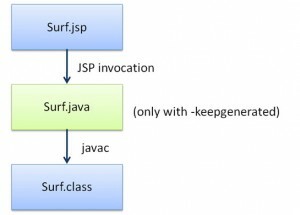 Verify that the JDK version used to precompile is exactly the same as the JDK used to run WebLogic. Make sure the time on the machine used for precompilation is synchronized with the machine where the application is deployed. Precompilation isn’t a new topic, however it is often done the wrong way or it is not done at all. Always precompile your deployments unless you manually create a quick distribution for testing during development. Don’t precompile using the <precompile> deployment descriptor after server start. Add the precompile step into your continuous build process. DevOps Basics I: Track Down High CPU Thread with ps, top and the new JDK7 jcmd Tool. I captured the following webcast last night. I was writing about how a clever combination of simple tools like ps, top and jcmd can help to track down the Java code that is causing a thread to consume a high amount CPU time. The approach is very generic and works for WebLogic, Glassfish or any other Java application. UNIX commands in the example are run on CentOS, so they will work without changes for Oracle Enterprise Linux or RedHat. Creating the thread dump at the end of the video is done with the jcmd tool from JDK7. 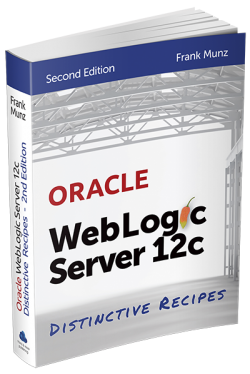 The webcast uses the StuckThreadForFree sample application which is specific for WebLogic 12c and can be downloaded from my stuck thread recipe. Using the time off during the bank holidays over Easter I spent some time coding and looking into more unknown details of WebLogic stuck thread behavior. (Actually I started to write this posting because I was told by my doctor to keep my mouth shut for some days, but that’s another story…). 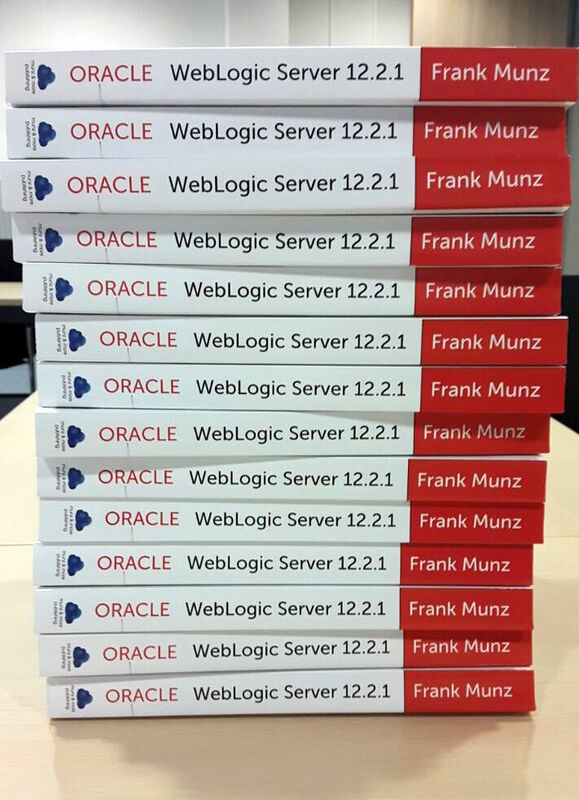 My personal task was to answer some of the most common questions I’ve encountered while consulting and running WebLogic 12c workshops. As often with my postings, this article is not meant to explain the basic concept of thread pools or workmanagers. I recommend to read the Oracle WebLogic 12c documentation about stuck thread handling first which explains how you can deal with stuck threads by configuring a workmanager. Also there are some excellent details about stuck threads (including WLST scripting and monitoring) to be found at the Middleware Magic site – a site run by a group of really knowledgeable guys. Now, typically customers tell me that they “observe some stuck threads”, “sometimes”, but often they are “not sure what caused them” and typically they “don’t know what exact state these thread are in” and in addition nobody seems to know if “the stuck threads ever clear up again without rebooting”. I am a pragmatic guy. 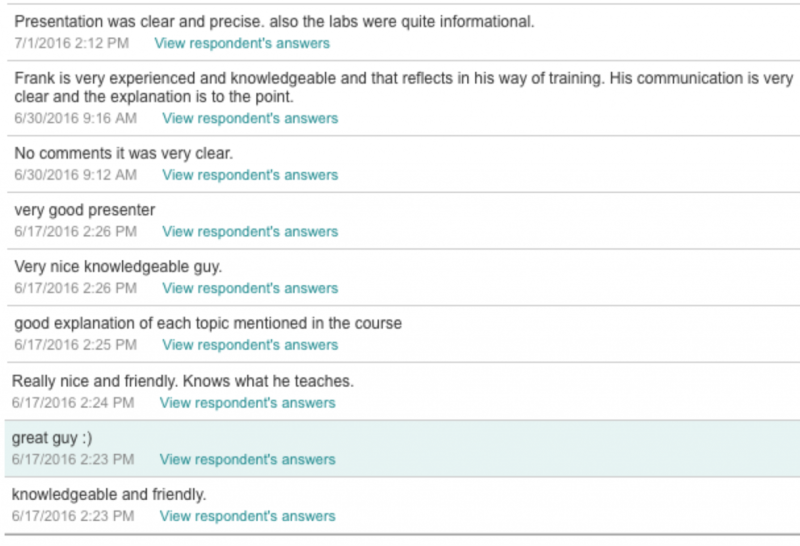 I enjoy having little applications or tools to demonstrate and measure how WebLogic is working. Keen to play around with the newest edition of Netbeans (I used to be an Eclipse guy) and EJB 3.1 in WLS12c I built a small application to easily test WebLogic stuck thread settings and countermeasures. The application allows you to create threads which are busy or which are waiting long enough to be detected as “stuck” by WebLogic. This little application will only work with WLS12c. I intentionally avoided JSF, so a plain JSP page is used to set your parameters. The JSP is calling a simple Servlet which in a for loop is calling an asynchronous business method of an injected stateless session bean. @Asynchronous and no-interface session beans are only available in EJB3.1 so you have to run it on WLS12c. Unlike in previous versions, the EJB is directly packaged into the .war file for deployment. Every call to the stateless session bean is serialized by the EJB container, so every EJB method is executing in its own thread. Depending on which method was called on the EJB is either waiting n seconds using Thread.sleep() or calculating some trigonometric function for n seconds. Both methods will cause stuck threads. There is zero configuration in the deployment descriptors for the EJB! Only context-root for the web part is set (which could be avoided as well). 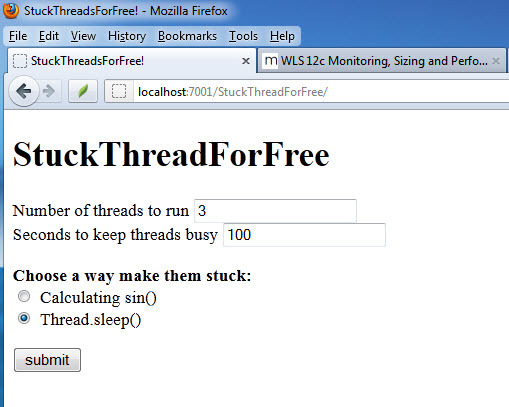 Building the StuckThreadForFree app with Netbeans was a smooth ride and a real pleasure. The app is provided as is. You can have it for free, yet there is no guarantee for anything but it shouldn’t cause any problems either. Better don’t run it on your production system. It’s just a hack. It demonstrates what it should, nothing else. Now, lets use the app to answer some typical questions. What are hogging threads? When do threads become hogged? After what period of time? So interestingly hogging threads are detected right away! In my case it took about 2 seconds (I had to hit reload once). So WebLogic transitions into FAILED state when a certain number of stuck threads are detected, right? That’s a common misconception! The default configuration of WLS 12c (I also checked for WLS 11 = 10.3.3) is Stuck Thread Count = 0, which means the server “never transitions into FAILED server irrespective of the number of stuck threads”. You will only see the FAILED state only when you set the value to a positive number of threads! Once the server transitions into FAILED, you can define if WLS should be shut down (and restarted by WLS nodemanager) or suspended. What exactly causes a stuck thread? What state does a thread have to be in to be marked as stuck? In general there is a number of different thread states in Java: NEW, RUNNABLE, BLOCKED, WAITING, TIMED_WAITING, TERMINATED. So both states can become stuck. Also, I am pretty sure I could also show the BLOCKED state when using a monitor lock for synchronization but due to time restrictions this is not included in the app. Can a stuck thread still do reasonable work? Absolutely! Just because a thread is marked as stuck it doesn’t mean it is frozen or unusable. 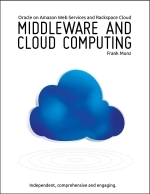 Imagine you wanted to calculate PI, you are creating PDFs, distance maps, mapping the human genome or you have deployed some JCA adapter talking to MQ-Series, SAP or PeopleSoft which is internally using a Thread.sleep() method call. All of this is are reasonable usages likely to occur in the wild. Do stuck threads ever dissapear? Can they be cleared somehow? Are they stuck forever? First of all you cannot get rid of a stuck thread by simply “killing it”. You cannot cancel or kill any thread in Java. However, stuck threads automatically will disappear if the condition clears up which caused them to be marked as stuck (e.g. the sleep period is over or the calculation is done). So once the condition causing the stuck threads is cleared also the stuck threads will disappear again! Stuck threads are not stuck forever. Phew! 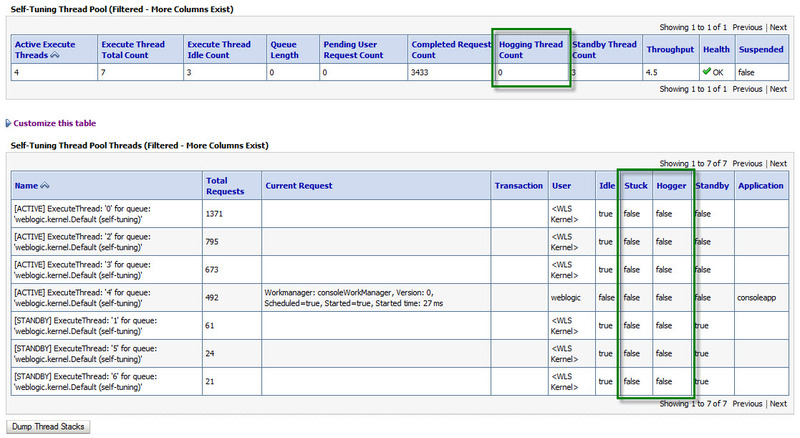 When should I use StuckThreadCount in the admin console or a Workmanager stuck-thread setting then? Very good question. Use StuckThreadCount from the WebLogic admin console or with a <work-manager-shutdown-trigger> definition moving the application into ADMIN mode if you can react on the FAILED state. 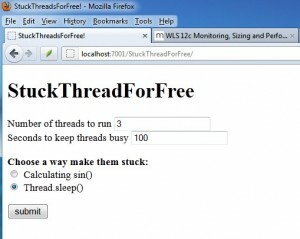 Do not use StuckThreadCount if the threads might be doing something useful and you cannot react on the situation anyway. Obviously transitioning into FAILED state and restarting WLS with the nodemanager is counterproductive if you threads are doing something useful. The following posting shows how simple tools like ps, top and jcmd can track down the exact line of Java code causing a thread to use a high amount of CPU. 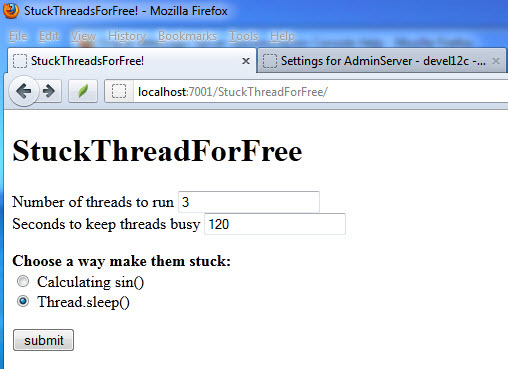 Exactly the same StuckThreadForFree application is used as here. Update: There is great follow-up post now by Mark Otting showing you how to use WLST to monitor stuck threads, including a ready to run WLST script! 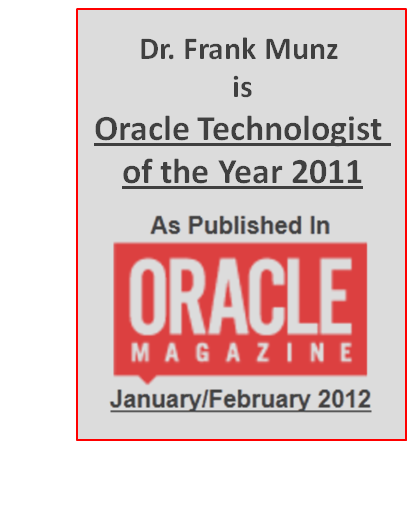 Actually something I was talking about just a while ago at a customer site. Thanks to Mark you can download it.